We are fortunate to employ a wonderful group of knowledgeable, highly motivated individuals. Most of our employees have been with us for 10 years or more. Their dedication and hard work allows us to continuously provide top quality koi and goldfish, coupled with unsurpassed customer service. 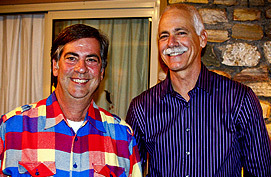 Co-owners Rick Brown (left) and Randy LeFever. Rick manages the Production Team, while Randy manages the Shipping and Customer Service Team. The Production Team hatches and raises all of our beautiful koi, butterfly koi and goldfish. Spawning, culling, feeding and health maintenance of koi and goldfish across 5 farms means that they stay busy year-round.